Hemingway claims that Allen attempted to lure her to Paris once she turned 18—two years after she had filmed Manhattan. "Our relationship was platonic, but I started to see that he had a kind of crush on me, though I dismissed it as the kind of thing that seemed to happen any time middle-aged men got around young women," writes Hemingway. The actress suggests that Allen attempted to act upon the crush by flying to her parents' home in Idaho and inviting the teen to Europe. "I didn't know what the [sleeping] arrangement was going to be [in Paris]...I wasn't sure if I was even going to have my own room. Woody hadn't said that. He hadn't even hinted it. But I wanted them to put their foot down. They didn't. They kept lightly encouraging me." Hemingway says that she woke up at night with the realization that "[n]o one was going to get their own room. His plan, such as it was, involved being with me." She says that she went into his guest room and woke him up asking, "I'm not going to get my own room, am I? I can't go to Paris with you." Allen left the next day. 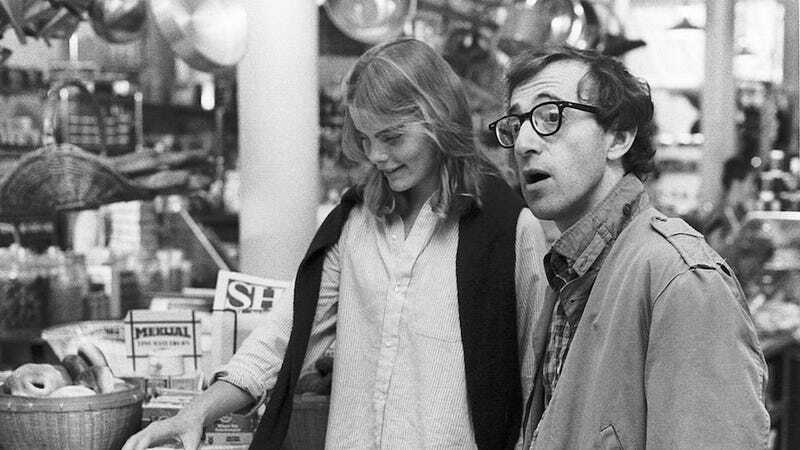 Hemingway has previously claimed that she never felt uncomfortable on the set of Manhattan, but that Allen "[made] me feel incredibly intelligent. He took me to museums and concerts. He gave me his wisdom, and you can see that in the character." She also says that their onscreen kiss was her first: "Fortunately it was a long shot and I didn't have to do much...he attacked me like I was a linebacker." America's most revered director, ladies and gentleman!